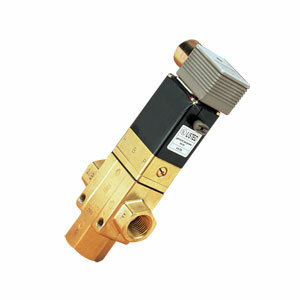 The SV-1500 3-way solenoid valve is an internally piloted poppet valve with epoxy-encapsulated coil and brass body. Manual override is standard. The valve features a quick exhaust design, Buna seal, and temperature range of -10 to 90°C (14 to 194°F). The valve is ideal for controlling compressed air for actuating large-sized cylinders and actuated ball valves. Electrical connection is by cable plug. Please download PDF file below for full product specifications and ranges. 참고: 1 Port R is always one size larger than the other ports. Therefore, flow rates from A to R are 1.5 to 2 times greater than the above values. 2 Operating with less than a 7 PSI pressure will yield unpredictable flow characteristics. 3 Maximum pressure for UL-listed valves is 170 psi.